This condo is perfectly located by land and water at the 23.5 MM off of KK. Enjoy the great main channel panoramic lake view from the private spacious deck or from the waterfront pool! This 550 sq. ft. 1 bedroom, 1 bath unit sleeps 4 comfortably. There is a king bed in the bedroom and a queen sofa sleeper that sleeps 2 additional people very comfortably (with a view of the lake). This unit has been completely renovated. There is a boat launch and trailer parking on site for your boating pleasure. There are several restaurants/bars on the lake that are close by (you can see Paradise from the deck), a couple of golf courses, and lots of shopping just a short drive away! This is a family friendly complex. Come join us for some lake fun! 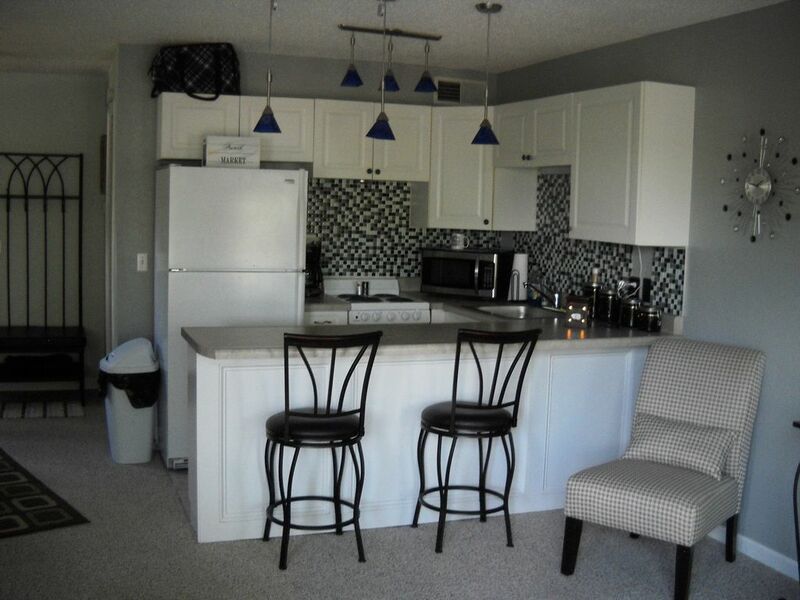 We are two couples who have purchased this condo in our complex to have as a rental unit for our family, friends, and new friends who are looking for a place to stay at the lake! Very family friendly! Gather and socialize while the children are swimming in either the pool or off the docks! Tennis court, swing set, and laundry on site! Trailer Parking with electrical and Boat Ramp for guests on site. Boat slip available with lift and remote for an additional $20/night. Contact owner to reserve. Super cute place, comfortable bed, nice view of the lake. We enjoyed our stay here & couldn’t complain about one thing. Place was clean. The people that we met by the pool that own places here were some of the friendliest people. We will be coming back to this place again. So glad you enjoyed your stay here. Was great having you. We welcome you back any time. Very clean, modern and well equipped. Owner takes great pride in her unit. Attention to details and ready to assist gives this owner top rating. Thank you very much, so glad you were pleased with our condo. We love to see our guests enjoy it here. Thank you so much for choosing our condo. So glad you enjoyed your stay here. We welcome you back anytime. The condo unit was well kept and comfortable for a getaway. Pool is a bonus, right on the water. Owners are easy to work with and friendly. Thank you so much. So glad you enjoyed your stay. Thank you so much Barb. We try to make our guests feel at home. So glad you enjoyed your stay with us. Donnie and Sandra. Clean, well cared for. Pleasant environment! Thank you so much. So glad you enjoyed your stay. Loved having you.